I could happily eat this for breakfast, lunch and tea ... how delicious it looks.. I make risotto quite regularly just for myself and certainly don't view it as special occasion food! Quite boringly I usually make mushroom, but sometimes vary this with courgette (idea taken from the 'Get Cooking' videos on the BBC website where Sophie Grigson makes courgette and herb risotto). BNS sounds good though with autumn imminent and I like the idea of paprika in there too. An entirely different question - as a cheese expert I wonder if I could ask how you tell if the surface of a cheese has mould or crystals? 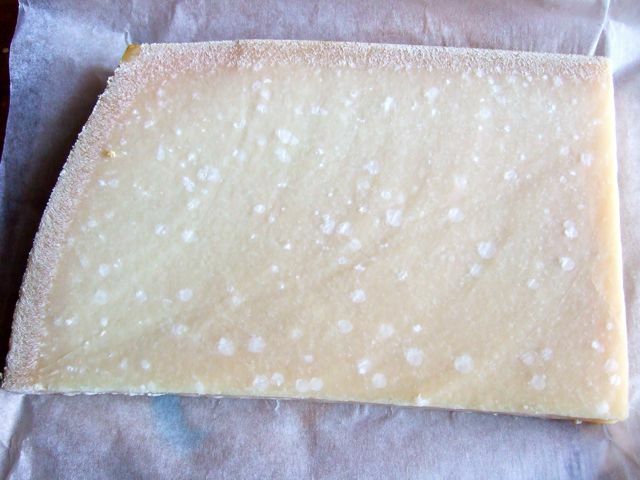 I'm assuming your parmesan is crystalline rather than mouldy but I recently opened a packet of (supermarket, sorry!) emmenthal to find small white 'bits' on it, predominantly in the 'holes' of the cheese. It was quite a pricey specimen but I don't know whether emmenthal usually forms crystals or not? Thankyou! Well, I'm not a cheesemaker C but I wouldn't have expected supermarket Emmental to develop crystals. It wouldn't be aged nearly as long as parmesan - on the other hand it may simply be the fat globules in the milk rising to the surface. But if you're unsure about it, take it back. ps I don't regard mushroom risotto as at all boring. I would say it's my favourite kind. Glad you like the BNS version, Charlie and Travis! We had roast squash and sage risotto a couple of nights ago, it's an absolute staple during autumn! Although I frequently use other squash which give a slightly different flavour such as acorn, carnival or crown prince depending on what they have in the grocers or Waitrose. Usually though I just cube and roast the lot then mash half before stirring into the rice at the end of cooking, I'll have to give this method a try instead. Time to treat myself to some saffron too perhaps! I may miss out the crème fraiche though as I never seem to like it when risottos have cream added. 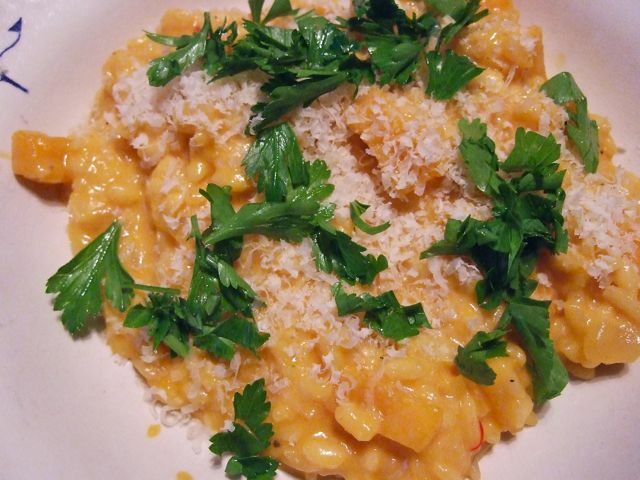 I love risotto, and a lot of people seem to think it's hard to make but it's so easy isn't it? Of course, I can't be doing with all that cheese though - so I make mine without any. I know you going to be outraged by that Fiona! 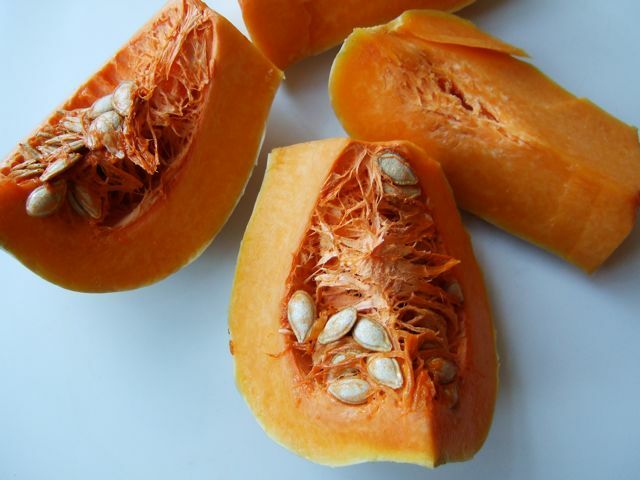 Think you need it (the cream) Becca to mellow the flavour of the squash - but give it a try. And I know your views on cheese, notsupermum *sigh*. You need some kind of counterbalancing savoury flavour. Some crisp fried streaky bacon might do the trick!